Tagged under Bishoujo Senshi Sailor Moon, Pom Pom Hair Ties, Waifu, Ponytail, Brown Hair, Green Eyes, Long Hair. A tall girl who knows her karate and doesn't shy away from close combat. However, despite appearances, Makoto is actually kind, friendly, a great cook and...quick to fall in love, even though she constantly brings up the senpai who "broke her heart". 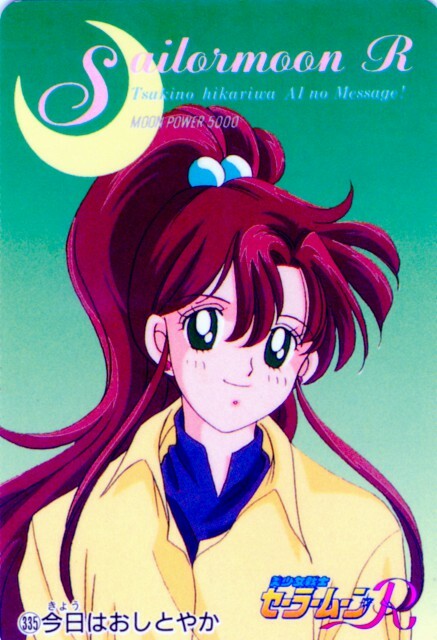 She is the fourth to join the team, after Ami Mizuno and Rei Hino, and controls lightning. Even though her love troubles are still kept in the Crystal anime, she doesn't dwell over her senpai as much.